A number of Christian theologians and apologists who do not accept a young earth view of creation teach that the first part of Genesis is not actual history. One of their common arguments is that Genesis 1 needn't be an accurate chronology of creation since the purpose of the passage was to show God as Creator and nature as not divine, but created, and that it was also intended to give the children of Israel a sense of history and purpose - a view of their place in God's plans. I totally agree that those are purposes of Genesis 1. However, the Genesis creation account was also intended to give an accurate chronology of what happened at creation. This is true of pretty much all of the Old Testament. It tells an accurate historical account of what happened and also teaches the character of God and contains foreshadowings of Christ and God's plan for the redemption of mankind. These things go hand in hand throughout the entire Old Testament. For example, take the story of Jonah. We know that Jonah's three days in the belly of the fish was a foreshadowing of Jesus' three days in the tomb. Jesus Himself alluded to this. We also know that God's change of heart toward Nineveh shows us God's mercy when people repent. The entire story of Jonah was really about redemption. It's a picture of Christ and salvation. But, that doesn't mean that Jonah wasn't a real person who really spent three days inside a real fish. The history is real, even though the story has many other purposes besides simply chronicling the history. Another example is the story of Abraham sacrificing Isaac. Again, it's amazing to see the parallels to Christ - the sacrifice of an only son, the substitute sacrifice of a ram, even Abraham's statement that God would provide the sacrifice. It's very obviously a picture of Christ's substitutionary atonement. But, Abraham was a real man who really took his actual son to the top of a mountain to sacrifice him and who really found a ram to sacrifice in his son's place. The history is real, even though it means more than just history. I could give many more examples. 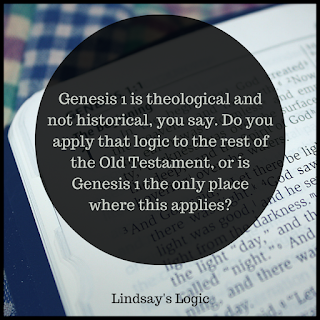 But the point is this: Why should Genesis 1 be any different than the rest of the Old Testament? Coming up with another purpose, or even multiple other purposes, for Genesis 1 doesn't mean it wasn't also intended to be real, chronological history. In fact, I would argue that this is an understanding of Genesis that is more straightforward, more in keeping with the genre and language of the Genesis text, and more in keeping with the nature of the rest of the Old Testament. The rest of the Old Testament is dual-purpose - history and theology. It would be quite singular and surprising if Genesis 1 was an exception, meant only to be taken as theology and not as chronology. Why Can't God Just Forgive Everyone?